The Men in Sheds base, located just south of Holme upon Spalding Moor. A New ‘Men in Sheds’ group for the Western Wolds area will soon be opening its doors and becoming a regular place for local men to meet. The group was recently presented with the ideal location to operate from after its chairman,Richard Wilkins, discovered the possible venue. Mr Wilkins found the shed near Holme on Spalding Moor, which was once used as a farm building and later converted into a training facility for long term unemployed youths. Because the site had been used to train people the building is fully equipped with machines and tools. 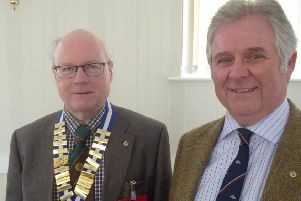 Gordon Weightman, secretary of the Western Wolds Men in Sheds branch, said: “Never in our wildest dreams did we ever think we’d find such a place like this! “A local building, already equipped and on our doorstep, desperate to be put back into good use. “But a lot of dust needs to be cleaned up. We need to sort everything out and plan exactly how it’s going to be used and to do that we need other men to join us. “It really is a golden opportunity to have a regular meeting place in the area and would welcome anyone interested. To find out more information about the Men in Sheds movement or to join the Western Wolds group email Gordon Weightman at gordonweightman@Yahoo.com.